There is nothing so gripping and at the same time so intangible as a first impression: the first glance from a high mountain or the sudden awareness of the harmony of colours.When Petrarca climbs the Mont Ventoux on April 26th of 1336, he is the first to put down in his traveller’s log such an experience ‘for the sake of experience itself’: ‘At first, owing to the unaccustomed quality of the air and the effect of the great sweep of view spread out before me, I stood like one dazed. I beheld the clouds under our feet, and what I had read of Athos and Olympus seemed less incredible as I myself witnessed the same things from a mountain of less fame.’ Petrarca’s view into the distance begets the depth of perception. Similarly, some 300 years later, Newton drilled a hole in a window shutter and caught the incoming light with a prism that showed him separation of sunlight into all the colours of the rainbow. This experiment led to new and far-reaching insights. In both cases, reality is consciously experienced, explored and mapped in a systematic manner. How do we explore the world and the reality around us? For a long time it was simply a matter of putting one foot in front of the other. By walking, every distance eventually becomes proximity. That what lies in the distance and is open to multiple and often contradictory explanations, takes on form and meaning once we get closer to it. This process of clarification seems to be the goal of explorers and cartographers, but for the scientist and artist, it is just the beginning. As an artist, Oscar Lourens has maintained his fascination for exploration and discovery and given it a central role in his work. The theme of passage and progress is fundamental in many of his works. In 2004, Oscar Lourens placed a sign with the text LA LUE 629 KM. Numerous others followed, both within the Netherlands and abroad. The network that emerged, indicated the various distances from the signpost to La Lue, the farmstead in Central France that functioned as the network’s centre and focal point. In La Lue, Irma and Henk, friends of the artist, have created their own pleasant world in which they live and work. Oscar Lourens has taken this spot as departure point for a large collection of works. In the elaborate La Lue-project the actuality that constitutes the four buildings of the farmstead is transformed into four card-index boxes. The thousands of paper cards with their razor sharp cuttings of the interior proportions of the buildings enables the spectator to enter the buildings in a different way. The stroll through the buildings now takes the form of fingers running through the cards. 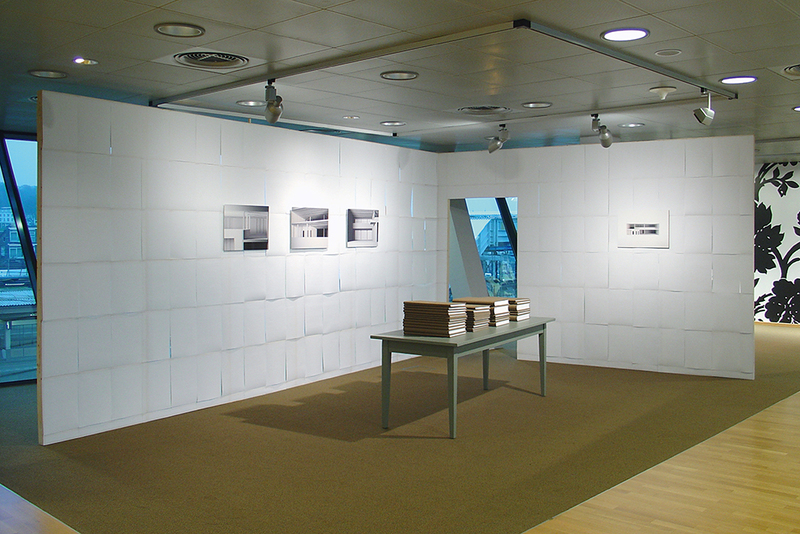 In untitled (La Lue – film) from 2002, a 55 minutes journey through the paper card cuttings is projected on the wall, reinstating the sensation of the original, architectural size. The passage is staged through a slow, fluent movement in which the details of the interior space are revealed. The spectator is enveloped in a world of white phases. The cinematic approach, in which experience and suggestion enforce each other within the strict time frame of the film, dissolves this architecture again in the light of the projection. This peculiar merging of analysis and suspense is typical for the approach of Oscar Lourens. Suspense, like that of Hitchcock’s films, acknowledges the central role of the spectator. It is the latter who, through active participation, completes the dynamics of the orchestrated suggestion of the film. Even though Oscar Lourens uses methods that seem to originate from the world of architecture or scientific research, Oscar Lourens calls upon a ‘reality beyond’: a reality in which the concepts of ‘measuring’ and ‘understanding’ have a much more complex relation to each other. 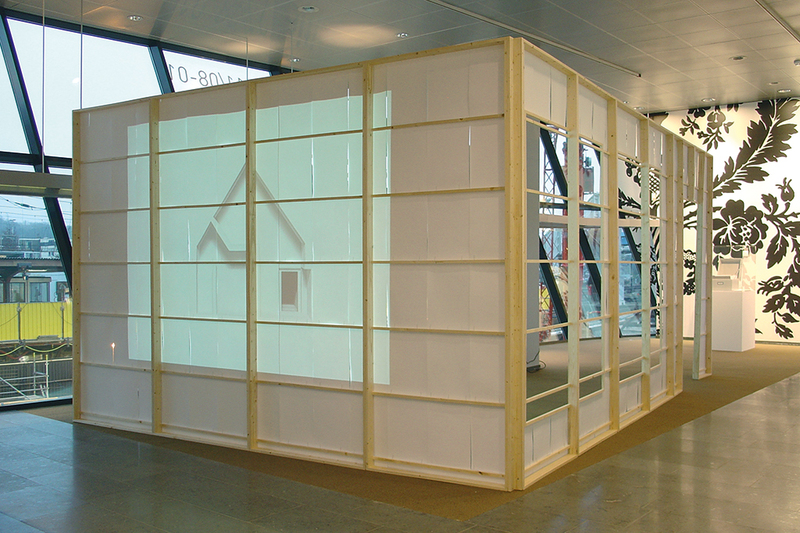 Looking at Oscar Lourens’ work, it is clear that in each project measurements play a key role. Whether contemplating the Bruges-project (1999), in which on the façade of a public building the surface area in square metres of the rooms behind the windows is written down, or the exhibition ‘Paperworks‘ (Arnhem, 2007) in which his own studio is rebuilt on a 1:1 scale in A3 sheets on a pinewood frame, the measurements are crucial. The exact recreation in paper, wood, cardboard, models and signs of the architectural reality of spaces, volumes, heights and depths, always produce a new reality. It is exactly the distance that emerges between our perception of reality and the exactness of the reproduction of its sizes that typifies his work. It seems as if the goal of Oscar Lourens is to make this tension tangible. One could speak of a ‘cartography of discrepancy’, in which an almost Cartesian poetry emerges between the real object and the artist’s ‘copy’. The accurate translation of an architectural reality into a model duplicate turns out to be a commentary on the physical sensation of space that proofs to be much more plastic than one realised. A return to the locations of our childhood years always creates amazement about the sizes of rooms, hallways or gardens. These deviate considerably from the images engrained in our memories. Likewise, the precise way in which Oscar Lourens translates actual objects to depersonalised quantities like size, rhythm and volume, offers room to the spectator. Hereby, he strips memory of its anecdotal and historical burden and returns it to the spectator as an open and accessible image. With his work, Oscar Lourens places himself in the tradition of conceptual art as it developed from the 1960s onwards. 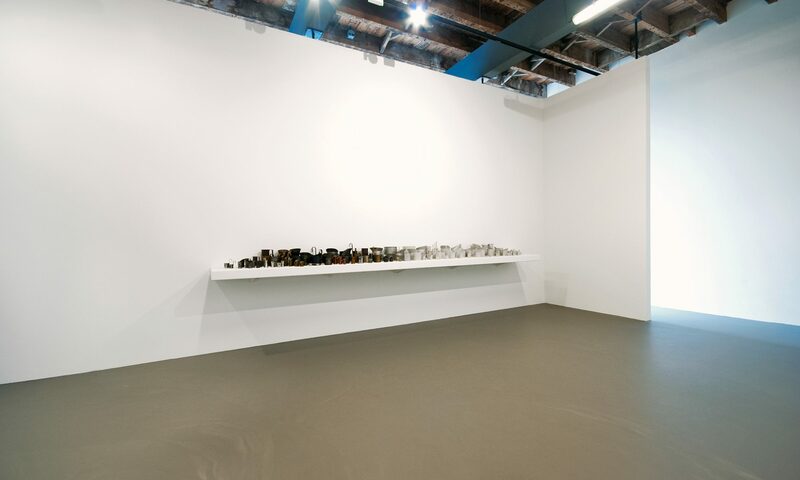 Stanley Brouwn, Hanne Darboven and On Kawara have separated, each in their own unique way, the artwork from the usual sphere of expression and emotion and returned it into the realm of initial awe. The openness in which a child asks questions about the world and reality, but also the scientist’s structured elaboration of such questions, are at the base of this kind of art. For example, the sequence of works in which Stanley Brouwn connects the size of his own footsteps with the uniform metric system reveals a new way of dealing with the phenomenon of ‘a walk’. Whereas from the Romantic period onwards, walking has constituted an individual or philosophical and above all an emotional connection between reality and experience, Stanley Brouwn’s work shows a clash between the crystalline reality of the number and the conflicting sensation of personal experience. 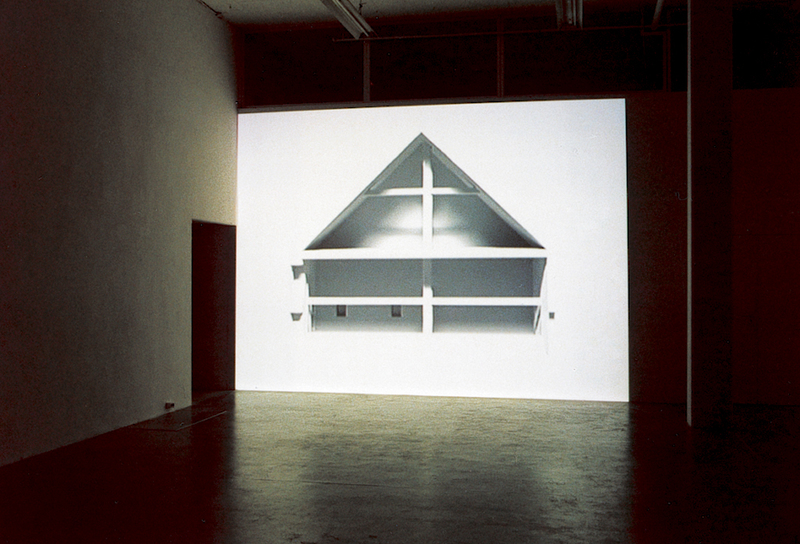 In 2003, Oscar Lourens created the publication (in an edition of fifty) portraits of spaces (after stanley brouwn) in which he describes each room in the La Lue farmstead in measurable sizes. The surface area, the square metres and the cubic metres are conscientiously registered. This creates a tangible discrepancy between the objectivity of these measurements and the individuality that each of these spaces nonetheless possesses – a character that is enforced by the title portraits of spaces. The objectivity of the measured sizes is employed to depict the ‘individuality’ or ‘uniqueness’ of the separate rooms. Numbers play a similar central role in the work of Hanne Darboven. The series, of often hand-written numbers, constitute works of art in which besides the given number also texts, pictures or postcards are used. The systematic accumulation of numbers provides these fragments-of-reality with an element of time. Without settling herself within a mathematical or scientific practise, Hanne Darboven uses those methods. Not only the aesthetic challenge of a systematic approach but also the liberating notion of a system open to time and space confronts every narrow scientific definition. An example is the project Kinder dieser Welt (Stuttgart, 1997). In 222 books she systematically questions the twentieth century by depicting toys with sequences of numbers based on the calendar. Hereby she connects the ‘the child as vehicle of hope’, through toys she collected from all over the globe, with an inevitable temporality. In this confrontation lies an explosive and liberating force. In the work of Hanne Darboven one remains conscious of the principally disrupting power of systematically and persistently asking a seemingly simple question. In a similar fashion to Darboven, Oscar Lourens also uses the intoxication effect of huge quantities to overwhelm the spectator. He also draws upon the aesthetic compelling force of a sequence of works. Even a casual glance on the thousands of paper cut-outs that populate the card-index boxes of the La Lue buildings are testimony to this force. On Kawara’s work is about a positioning in time and space following a strictly systematic approach. Whether considering his Date Paintings, in which the painting is solely the registration of a date in time, or his post cards with the message ‘I got up at’ plus the time he rose from his bed, in all his works he emphasises the inevitable passing of time. When he sends telegrams with the message ‘I am still alive’ he does not only answer an unasked question, he also points in a slightly disturbing way to the possibility of the opposite of this remark. The way in which On Kawara, in his project One Million Years (Past) (1969) and One Million Years (Future) (1980) in twenty books, ranks two million years (one million counting down into the past and another million adding up into the future) seems to receive a subtle reply in Oscar Lourens’ untitled (Bibliothèque de l’architecture III) from 2004. In this work, the total area of all the La Lue buildings are laid out in A3 paper sheets, which are bound in thirty-five books. The universal, chronological ordering of Kawara meets the personal filing system of Oscar Lourens in which he connects place and space, abstraction and reality all within a single stage, namely the book. When Oscar Lourens measures the buildings of his choice and transforms them into card-index boxes, models, books or area indications, he also reports about his relation to these locations and buildings. The locations we visit nowadays as consumer or tourist pass us by in increasing speed and, due to the media and internet, in an almost immaterial way. Although we are all able to relive our many, often elaborate visits of faraway places, in the end less and less of it seems to make us pause to contemplate our thinking and acting. In contrast, the work of Oscar Lourens makes his meetings with (architectural) spaces, surface areas and distances very concrete. His work unfolds itself as a domain of experience that accumulates but also deepens over the years. An extending but nevertheless connected totality in which he uses in a remarkable way the ‘pure’ and detached method of describing, whereas he actually debarks is on a very personal journey of exploration. Combining the wonder that typifies both the child and the explorer with the systematic precision of the scientist, Oscar Lourens makes art out of the sites that come across his path. The results are highly material works of art that direct our views to the elusive experiences connected to them and that confront us in such a charming way with the coordinates of experience.